When you are passionate about something it shows and can make all the difference. You will find you feel more energetic when you are doing something you really care about. Whether it is your dream career or something creative like art or caring for others, passion makes all the difference. 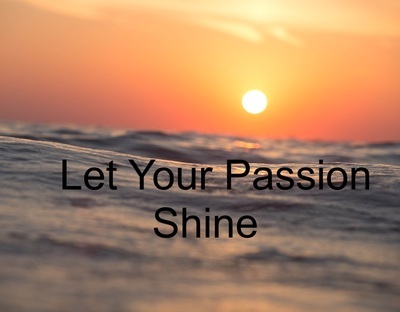 You shine as you talk about your passion and it makes the topic much more interesting to others. Years ago I participated in a public speaking course offered to carers to give them the confidence to address a group and talk about their experiences as carers. Some of those attending the course were shy and definitely 'unaccustomed to public speaking'. A few did have prior experience with addressing an audience. To be awarded a certificate for doing the course each of us had to stand out the front and give a talk to the group. This was daunting for a number of participants. One of the older women was very nervous and more so when the young person before her gave a talk accompanied by a professional PowerPoint presentation. How could she compete with that? The truth is, very well. Her presentation was simple and her props consisted of nothing more than a few 8"x10" photos which were passed around the small group. But she had a secret weapon. That weapon, her trump card, was passion. She spoke from the heart and was interesting. She really did have her audience 'eating from the palm of her hand.' In contrast, the presentation before hers was rather boring. Passion is a trump card every time. Let your passion shine through and let your enthusiasm work for you.